Three-phase transformers for voltage adaptation. Three-phase transformer of 1kVA of ultra isolation with metallic box, allows the adaptation of voltage between line and receiver in three-phase systems. It has an electrostatic safety screen that filters and conducts unwanted signals and disturbances to ground. Three-phase transformer of 2 kVA of ultra isolation with metallic box, allows the adaptation of voltage between line and receiver in three-phase systems. It has an electrostatic safety screen that filters and conducts unwanted signals and disturbances to ground. Three-phase transformer of 3 kVA of ultra isolation with metallic box, allows the adaptation of voltage between line and receiver in three-phase systems. It has an electrostatic safety screen that filters and conducts unwanted signals and disturbances to ground. Three-phase transformer of 5 kVA of ultra isolation with metallic box, allows the adaptation of voltage between line and receiver in three-phase systems. It has an electrostatic safety screen that filters and conducts unwanted signals and disturbances to ground. Three-phase transformer of 8 kVA of ultra isolation with metallic box, allows the adaptation of voltage between line and receiver in three-phase systems. It has an electrostatic safety screen that filters and conducts unwanted signals and disturbances to ground. 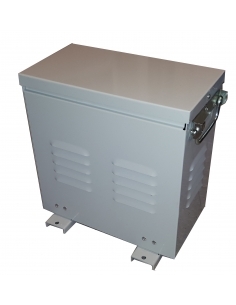 Three-phase transformer of 10 kVA of ultra isolation with metallic box, allows the adaptation of voltage between line and receiver in three-phase systems. It has an electrostatic safety screen that filters and conducts unwanted signals and disturbances to ground. Three-phase transformer of 12,5 kVA of ultra isolation with metallic box, allows the adaptation of voltage between line and receiver in three-phase systems. It has an electrostatic safety screen that filters and conducts unwanted signals and disturbances to ground. Three-phase transformer of 16 kVA of ultra isolation with metallic box, allows the adaptation of voltage between line and receiver in three-phase systems. It has an electrostatic safety screen that filters and conducts unwanted signals and disturbances to ground. Three-phase transformer of 20 kVA of ultra isolation with metallic box, allows the adaptation of voltage between line and receiver in three-phase systems. It has an electrostatic safety screen that filters and conducts unwanted signals and disturbances to ground. Three-phase transformer of 25 kVA of ultra isolation with metallic box, allows the adaptation of voltage between line and receiver in three-phase systems. It has an electrostatic safety screen that filters and conducts unwanted signals and disturbances to ground.